MANCHESTER, NH – It is easy today to focus on what divides us. But, according to the results of a statewide survey of Granite Staters, Rights & Democracy found that when we talked to people in communities throughout New Hampshire – at farmers’ markets, community meetings, parades, at their doorsteps and on the phone – they shared both the same deep concerns and broad agreement on common solutions. Whether in rural or more populated areas of our State, among young and old, men and women, those with more money and less, the Granite Staters we talked with largely agreed on the major issues confronting their families and communities and the solutions needed. And while there were differences based on politics, on most issues there was broad agreement. The survey found strong agreement among substantial majorities that the major issues facing Granite State families and communities are: lack of access to affordable health care; the impact of the overdose crisis; quality public education; jobs that don’t pay enough; the cost of meeting the basics in life; the affordability of college and career training; and pollution of land and water. 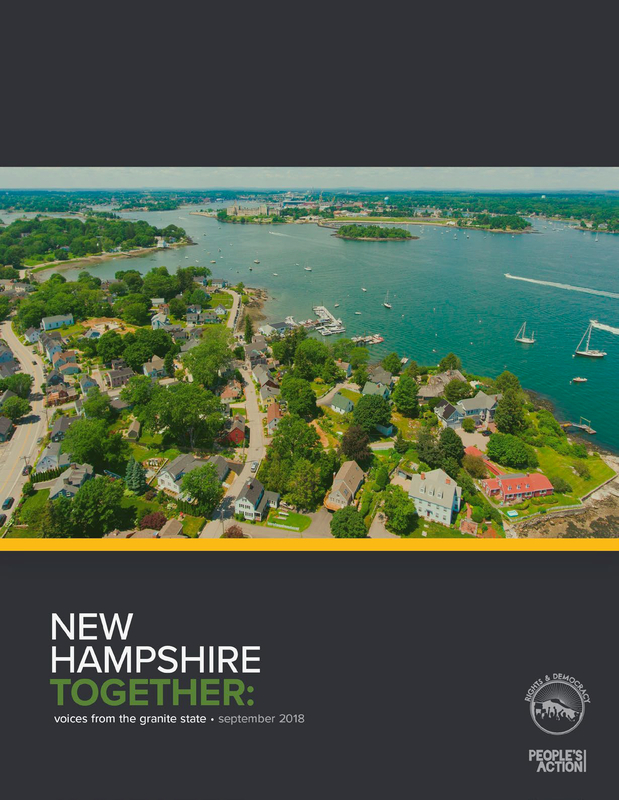 “New Hampshire Together: Voices from the Granite State” is the result of a survey of 889 residents who filled out the New Hampshire Community Survey, which was conducted beginning in the winter and continuing through the summer of 2018 by the Rights & Democracy Education Fund. This report is part of a national Rural and Small-Town Organizing Strategy launched earlier this year by People’s Action, a national organization of which Rights & Democracy New Hampshire is an affiliate. Some issues we found to be more politically divisive, including: prejudice and discrimination; not being welcoming to immigrants; and climate change. Even on these issues, strong majorities of those we talked with identified the first two as major problems and a majority agreed that climate change poses a threat to their communities. Almost half of the people we talked with, and a majority in more rural areas, are also worried about the impact of young people leaving rural areas and small towns. Raising taxes on the super-rich and big, profitable corporations. There was also majority support for solutions to tackle prejudice and discrimination and climate change. We found very low support for cutting government regulations or deporting more immigrants, including in communities that voted for Donald Trump in the last election. Rights & Democracy New Hampshire is working with community members and allies throughout the state for true, lasting solutions to several of the community problems identified in our survey, including issues of health care, quality jobs and public education. Health care the top concern: The top concern by a significant margin, is “Access to quality, affordable health care.” Almost two-out-of-three people (65%) ranked themselves as very concerned. This is in line with many national polls, which find that health care costs are the top concern of Americans. Health care was the top concern in all regions of New Hampshire, both the Southeast counties which are more populous and the State’s rural counties. Health care is a major concern of both men and women, although women are slightly more concerned. It is a top concern of adults of all ages, although older adults are more concerned than middle-aged adults, who are mostly likely to have employer-based coverage. Overdose crisis is a major concern: Another issue that is driving up health care costs in New Hampshire more than other states is the overdose crisis. The New Hampshire residents who filled out our survey clearly realize that, as four-out-of-five (80%) said they were concerned about “the impact of the drug and opioid crisis in our community,” with more than half (55%) very concerned. Concern with the overdose crisis is at equal levels in rural and more populous areas of the State, among men and women and among all age groups. People with low-incomes, under $34,000, were more likely (65%) to say that opioids are a major problem than middle-income people; still 58% of people who earn from $35,000 to $149,000 say it’s a major problem. Only among the those with incomes over $150,000, did a minority (38%) list the overdose crisis as a major concern, although a total of 75% said of them said it was at least somewhat of a concern. Quality public education: New Hampshire residents are also deeply concerned about “quality public education,” with almost four-out-of-five (78%) concerned and more than half, 55%, very concerned. The concern was strong across all regions of New Hampshire and all demographic groups. Like other Americans, Granite Staters understand the importance of a quality public education to providing opportunities for their children and the promise of economic vitality to their communities. National ratings put the State’s public education system among the best in the nation. But the State continues to suffer from a huge imbalance in education funding, which hits hardest on rural towns, where there are high tax rates, lower incomes and property values. At the root of the problem is New Hampshire’s reliance on local property taxes to fund 71% of public education, with another 19% from the statewide property tax. “Affordable health care for everyone” was the top choice, rated 5 by 76%. The lack of affordable, quality health care was the number one problem. “Getting big money out of politics” was the 2nd choice, with a rating of 5 by 72%. “Government being controlled by big monied interests” was the top culprit identified. We also saw majority support for two ways that government can create jobs and improving communities: Government investment in jobs on projects like fixing roads & bridges, public transit & modernizing schools: and “Government support for jobs in clean, renewable energy. Maintain Medicaid expansion to cover more than 50,000 Granite Staters. Expand treatment for opioid treatment – through Medicaid expansion and providing access to non-prescription treatments, such as acupuncture. Challenge onerous forced work rules that are attached to the Medicaid expansion program (and which have been struck down in other states) and could force thousands to lose access to health care. Work with our national partner People’s Action to fight for an improved Medicare for All. Raise New Hampshire’s minimum wage to $15 an hour – it has been stuck at federal default of $7.25 an hour since the repeal of the state minimum wage in 2011. Create a paid family leave and medical benefit that would give folks paid time off to care for an elderly and ailing parent, a sick child or spouse, or to enter into a recovery program. Expand commuter rail in Southern New Hampshire to provide job opportunities, boost economic development, and ease our reliance on fossil fuels. Ensure that every child, regardless of their income level, zip code, race, or ability receives a quality education, as a right not a privilege.